2019 Program Registration now available. Register soon so you can reserve a space for this summer. We have big plans, a great facility, new (to us) Optis and Lasers as well as our fleet of 420s and FJs. We have added other new boats and much more for the 2019 season. elcome to Bow to Stern Sailing School’s Youth Sailing Programs. We are located at the Bow To Stern Boating Center, 290 Blackwell Point Loop Rd in Oriental, on the protected waters of Smith Creek. The park like setting, with 200+ feet of waterfront, is perfect for our Youth Programs. Registration is now underway for the Youth Sailing Courses for summer 2019. There are week long “camps” from June through August. Read the Class and Program Descriptions for detailed information about each class/program. Check out the Summer Camp Calendar and Register for our summer programs. Also look into our Other Programs that might be of interest. In addition to the sailing curriculum, Bow To Stern strives to teach life skills and reinforce the natural leadership of the students. On and off the water, students are encouraged to display respect, humility, stewardship, and cooperation for the greater good. It is our hope and highest aspiration to help build the strong foundations within an individual that support long-lasting, healthy relationships with others, the earth, and themselves. Who we are… Meet the Lead Instructors. What we do… Our two main programs include a Youth Sailing Camp and a Racing Clinic Program, which all offer kid-friendly, yet intensive sailing experiences to students age 7-16 by combining on-the-water experience with classroom activities. With Beginner, Intermediate, and Advanced camps, young sailors are able to progress through different levels at their own pace. Racing rules and tactics are taught at the Intermediate and Advanced level so students may participate in local and regional regattas. The older sailors can participate in the Racing Clinic which will enhance their Leadership and Sailing skills through many different activities designed for young adults. Without the support and suggestions of others, Bow to Stern would not be what it is today. If you want to contribute time, energy, or ideas please feel free to contact us. We especially welcome experienced sailors and skilled motor boat drivers as volunteers. 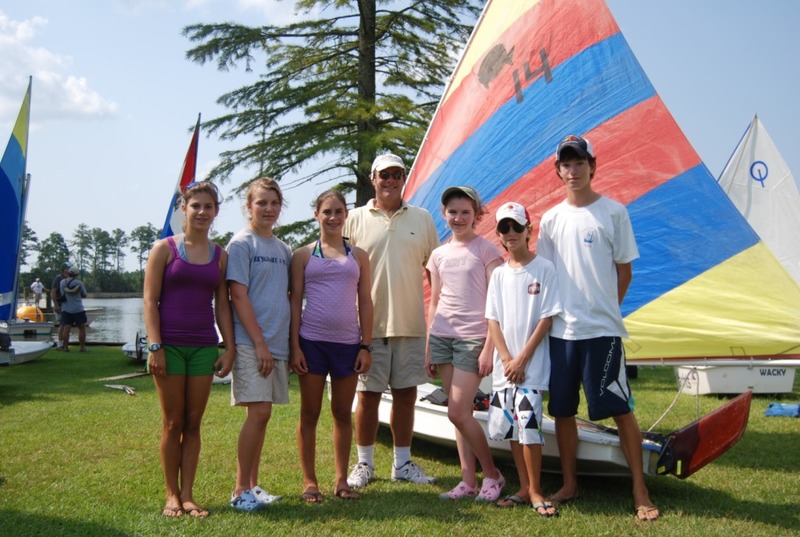 The Youth Sailing Program was only a dream as recently as 2008. Community members and business owners in Oriental and Pamlico County came together to make the dream a reality. From volunteering hundreds of hours building our beautiful fleet of wooden Optimists, to donating program materials and resources, the community efforts launched a summer program which now has reached close to 1500 children, both locally and as far away as Texas, New York, Mexico, Greece, Costa Rica, and Sweden. In the maritime spirit and tradition, each of the Optimists were named and christened with sparkling water in a celebration for good luck in the many seasons to come.